This really is a very different pozole, not only it is vegetarian it is also green. These are many variations for a pozole, considering that the most popular pozole is the red pozole with pork. – The word pozole comes from the Nahuatl pozolli = foamy. Although the dish doesn’t generate foam , the corn kernels that float on the pozole’s surface do look like foam. The pozole consists of a kind of soup with a wide combination of ingredients , which are served as if they were a “soup- salad " (you will see why). 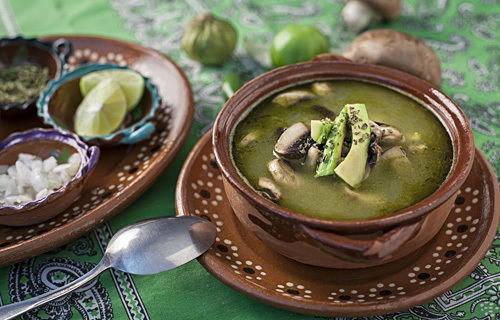 In this pozole the main ingredients are the maize and the mushrooms; which are prepared in a green color broth with a penetrating, condimented and fresh flavor. But that’s not all... there’s more... Also several garnishes are put on the table like: radishes, onion, lettuce, limes and many more. The purpose is that each diner keeps on preparing the pozole to their taste . As result a formidable soup is obtained, which is accustom to serve as main course since after a tasty pozole plate the people end up satisfied. To make the pozole many ingredients are needed and many steps have to be followed. This may intimidate. But don’t get scared it is not difficult to make the pozole, only the procedure has to be followed to the letter. The pozole can only be prepared with white hominy. By no means prepare it with another type of maize. The recipe is given with precooked maize, if your maize is not precooked you will have to follow these steps. It is very important to get ramekins because many ingredients are going to be put on the table. The preparation time is of approximately 1 hour 15 minutes . This recipe serves about 6 plates. The enough Water to cover the saucepan ingredients. Transfer from the saucepan to a blender, with a kitchen spoon, the tomatillos and the chilies that were cooked. Strain the Green Salsa that was cooked. When the broth boils reduce to low heat, cover the saucepan and leave the vegetarian green pozole cooking for 10 minutes, so the flavors mix. Recommendation: This pozole can also be accompanied with tostadas covered with refried beans. The Mexican love this combination! Variation: The pozole can also be prepared with chicken. Did you like the Vegetarian Pozole? The epazote gives to the food the authentic Mexican flavor and in this recipe this herb cannot be omitted. If you don’t have it buy this epazote bag, it has a good aroma and it gives an excellent flavor to the food.